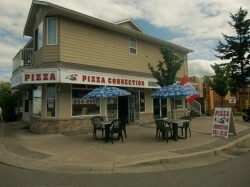 There is an unassuming little pizza shop quietly poised in a location on Weld Street in the heart of Parksville Downtown. For 15 years Pizza Connection has build an enviable mid-island reputation for Pizza, Pasta, BBQ Ribs and Chicken. We make all our pizza's by hand, using only the freshest ingredients possible. Our Pizza's are cooked on stone, which is the traditional method and makes the crust taste so much better!